Preparation: Scrape the ridge gourds(janhi)and chop into similar small pieces. Peel the potato (aloo) and chop into similar small pieces. Wash both and drain. Wash and chop a tomato. Grind the poppy seeds (posto)into a paste (might require little water). Set aside. Heat a cooking pan (kadhai) and add 2 tablespoon of cooking oil. When it becomes hot add cumin seeds (jeera), let it crackle. Then add slitted green chillies and the chopped potatoes and saute for 5mins, till slightly translucent and tender. Now add tumeric (haldi), chilli powder (lanka powder) and coriander powder (dhania powder) and mix all together. 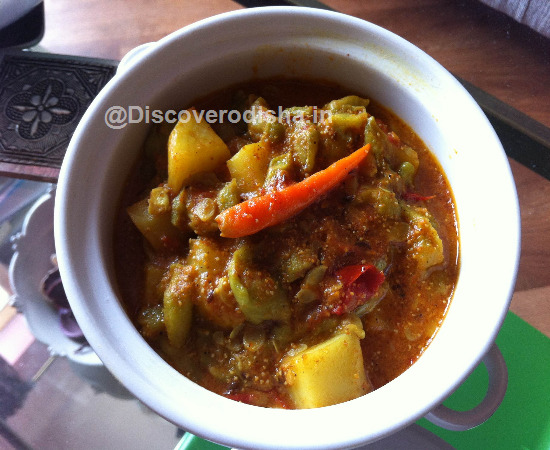 Add the chopped ridge gourd (janhi), mix and cook for 5mins. Then add chopped tomato and salt to taste, mix and simmer for 2-3mins. Finally mix the poppy paste (posto) and let it simmer for 3-4mins until the gravy becomes thick. Garnish with freshly chopped coriander. Serve with roti or chapati. Serves 3-4 persons Oil (Tailo)- 2 tablespoons Ridge gourd (Janhi)- 6 medium long Poppy seeds (posto)- 3teaspoons (3 tsp) or 10g Potatoes (Aloo)- 1 medium size green chilli (Kancha lanka) - 2 medium size Tumeric powder (Haldi)- 1tsp Red chilli powder (Lanka powder)- 1tsp Coriander powder (Dhania powder)- 1tsp Cumin seeds (Jeera)- 1tsp Tomato (Tamatar)- 1 medium size Salt to taste Fresh coriander for garnish.